Tabriz is located in the north west of Iran. Indeed, it was once Iran's capital backbone during the Safron period (AD 1502-1736). The town has a long history and once housed many historical monuments. Unfortunately, repeated invasions and natural disasters destroyed many of these treasures. Tabriz is also the first, or last, major city you will pass through coming from or going to Turkey on the overland route. The city gives the feeling that it is not set up for mass tourism. Which in itself can be a relief, but there is actually quite a bit to see if you interested. The Quri Chai river runs through Tabriz. Most places that would interest a visitor are on the southern side of the river. Tabriz' city center is located around the bazaar. The Blue Mosque - Destroyed by an earthquake, renovations are currently under way inside this beautiful building. It's one of the few places you can walk around as architects and archaeologists work together in the restoration process. The Main Bazaar - Built by Jomhun-ye Eslami St is the oldest in Iran. Its gold market is a great place to meet and talk with some of the local merchants. It's also one of the thriving areas for currency exchange. Well worth a visit just to see people walking around with huge wads of Rial. Ark-e-Alishah (or Arg e Tabriz is the remains of a fortress dating back to the Ilkhanate period in the 13th-14th centuries. El Goli is a park sprawling around a square artificial pond. A restaurant on an island in the middle of the pond serves tchelokebab and is a good place to relax on a warm summer's day. 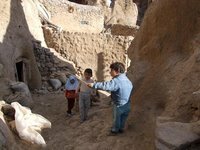 Kandovan - A small village about 50 kilometres out of Tabriz. The village is similar to Goreme in Turkey because the village houses have been carved out of the soft surrounding rock of the mountains. Due to Tabriz's ancient Safron period there are many great poets, writers and artists linked to the former capital. Check with the tourist office as their is nearly always something going on. Like most of Iran, Tabriz is a year round dry city. Though in winter the day and night temperatures can get pretty low, sometimes below zero at night. While in summer temperatures can rise up to 40 °C and although it's still fairly dry air, this is not the best time to visit. Tabriz International Airport has a number of flights serving the city. Iran Air flies to Istanbul, Tehran, Mashad, Esfahan, Kish, Ahvaz and Bandar Abbas. Other destinations with other airlines include Dubai, Damascus, Rasht, Asaluyeh and Bandar-e Mahshahr. There is an overnight train to Tehran. Also international train routes link Iran to Turkey and Syria. The station is 5km west of the city centre. You need to have your license plate changed to Farsi. The tourist office will help you here. Also beware of the metering system for fuel, again the tourist office can help you. Buses link Tabriz to the rest of Iran in a large sprawling network. They are incredibly cheap and quite comfortable. Often having snacks and drinks. Traffic is not so crazy out side of the city center. But again you need to be aware of the laws. Taxi's have meters, but English is not spoken. Language will be you main issue here. But it's worth hoping on a local bus just for the interest alone. Most of Tabriz can be walked in but in the heat you may want to hail a cab. Possible if you have your own. There are countless eateries around Tabriz. From burger joints to Kebabs. For a more upmarket yet still incredibly cheap out try Modern Tabriz Restaurant on Imam Khomeini street. Other wise ask at the tourist office for their local recommendations, and be prepared for a treat. No Alcohol. But you can buy Malt lemon beer. Takes a while, but refreshingly different. Bepsi, is their version of Cola and is quite sweet. Hotel Mashad offers basic shared bathroom rooms at a reasonable price €4-5. The shower is extra. And like most hotels in Iran they need to hold onto your passport so don't be alarmed. Make it a priority to visit the Tourist Information Office right in front of the Main Bazaar. It's located in the archway that you can't miss. Nassem and his Brother are two of the best tourist information officers in the world. That's a claim backed up my the many many signatures and comments in their guest books. They are gentlemen that will offer you the best of hospitality. Their tours are good, and they will help you change money for no commission. You'll find internet cafes in most cities and even smaller towns now have access to the world wide web. Like other countries with a very strict censorship, the country has strict rules about using the internet and also has a very restricted domestic version, highly unlikely to be used by travellers. There are not so many obvious internet cafes around. You will need to roam the many shopping centers around Jomhun-ye Eslami St. They are not so fast, but are quite well run. 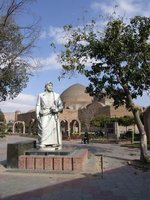 We have a comprehensive list of accommodation in Tabriz searchable right here on Travellerspoint. You can use our map to quickly compare budget, mid-range or top of the range accommodation in Tabriz and areas nearby. This is version 19. Last edited at 9:34 on Aug 23, 16 by Utrecht. 12 articles link to this page.